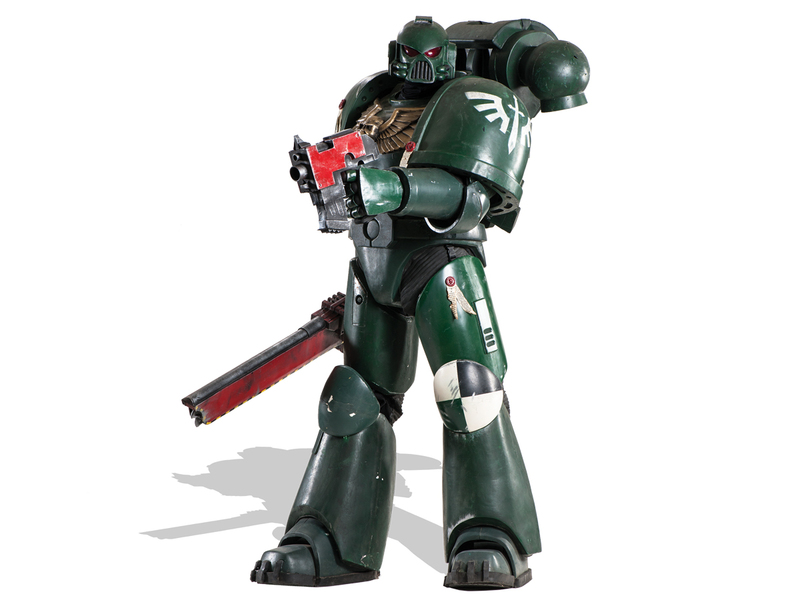 Petaluma, California, based artist Shawn Thorsson creates costumes and props of epic detail and proportion — we even featured him on the cover of Make: Volume 32 alongside his 8-foot-tall Imperial Space Marine. Until recently, he predominantly used traditional mold-making techniques and tools for his builds. In the summer of 2012, he entered the Instructables Make It Real contest and won the grand prize of a $50,000 Objet30 3D printer, which he’s named Jarvis. We chatted with him to find out how having a professional-grade printer at his disposal has affected his art. 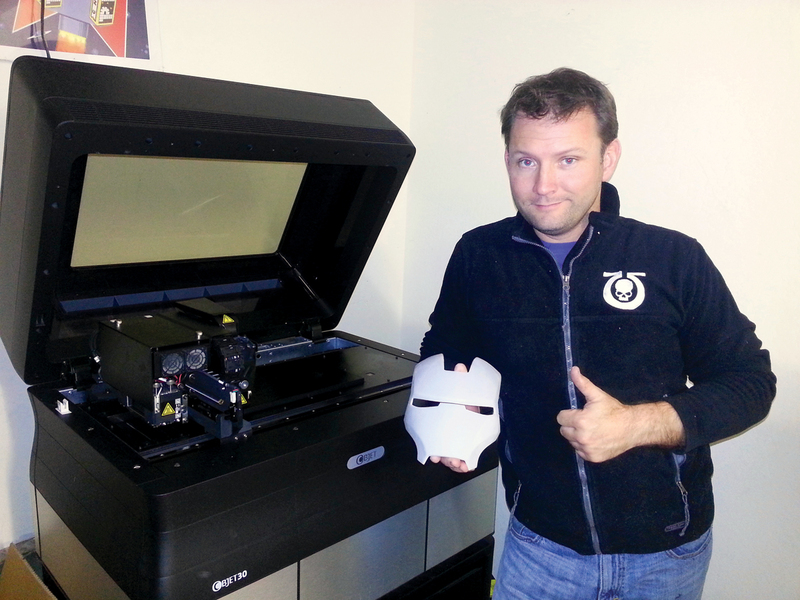 Were you in the market for a 3D printer before entering the Instructables contest? It would make more sense to say I was watching the market for 3D printers. I decided I needed one as soon as I’d first heard of it, but with prices getting lower and capabilities getting better almost daily, it made more sense to wait until I could get a machine that did everything I needed for a price I could afford. The Instructables prize just catapulted me ahead a few years. How did you envision the printer was going to help you in your studio? Mostly I figured it’d be like having another pair of hands. When I’m making details for props or costumes, I often have to cobble together all sorts of small parts out of whatever found items I have around. Rapid prototyping would allow me to have exactly the right thing instead of having to come up with a “close enough” thing. What is your relationship with Jarvis like? I love that machine. It’s reliable and low-maintenance and continues to perform exactly as advertised — knock on wood. That said, I hate that machine. I used to feel that there was a lot more art to my various projects. Now, whenever I run into a sticky part of a build, something that used to require a creative, tangible solution, it seems like the easy answer is almost always, “I’ll just have Jarvis make it.” Before much longer I’m going to forget how to use that drill press thing collecting dust in the corner of my workshop. What types of jobs is Jarvis best suited for in your studio? I use him for prototyping small, highly detailed parts. If there’s a widget that needs to be just so, I can feed him a model and count on it coming out perfectly while I work on other things. There’s a handful of things that he definitely can’t do. Whenever I need a biological shape such as a creature’s head or one of my garden gnome sculpts, it’s almost always faster and definitely easier to sculpt out the prototype by hand using a lump of clay and some very basic tools. The other thing I run into is problems with the printed material itself. The cured resin is a bit brittle. I dropped a prototype for a pistol prop and it shattered spectacularly when it hit the concrete floor in the workshop. It also has really poor memory characteristics. Thin pieces end up sagging under their own weight if they’re not reinforced or supported in storage. Since I’m usually looking for a prototype to reproduce in more durable materials, this isn’t a huge problem, but it definitely means that I have to start the molds pretty quickly after the printed parts are prepped, primed, and painted. Still, the biggest problem I run into is people’s perception. So many folks think that having this machine has given me a “magic button” solution to every problem. It’s definitely not that. Did you know how to make 3D files before owning a printer? Yes and no. I have an engineering degree, which I earned back before the turn of the century. So I had some vague memories of CAD programs that I was trained on back when floppy discs were still in vogue. More recently, I spent a bit of time tinkering with 3D modeling when I added a low-end CNC machine to the workshop. His name is Lopez. What CAD program are you using now? I’m still a pretty low-budget operation, so my software suite is limited to the sorts of things that I can get for free. I’ve been making use of everything from SketchUp and Tinkercad to Blender and Netfabb. Each of them has strengths and weaknesses of their own, so I spend a lot of time importing and exporting files between them in order to take advantage of them all. I’ve learned by trial and error and the occasional online tutorial. It’s safe to say I spend much time scrolling though help menus as well. I’m also experimenting with trial versions of some more expensive programs because it’s pretty clear that I’m not using my equipment to its fullest potential. Most of the time I end up bartering pieces and parts in exchange for digital models from folks who have greater skills than me. In short, ever since Jarvis was unwrapped, I feel like some kind of caveman using a smartphone to crack open nuts. What plans do you have for Jarvis? I don’t have anything especially grandiose in mind. 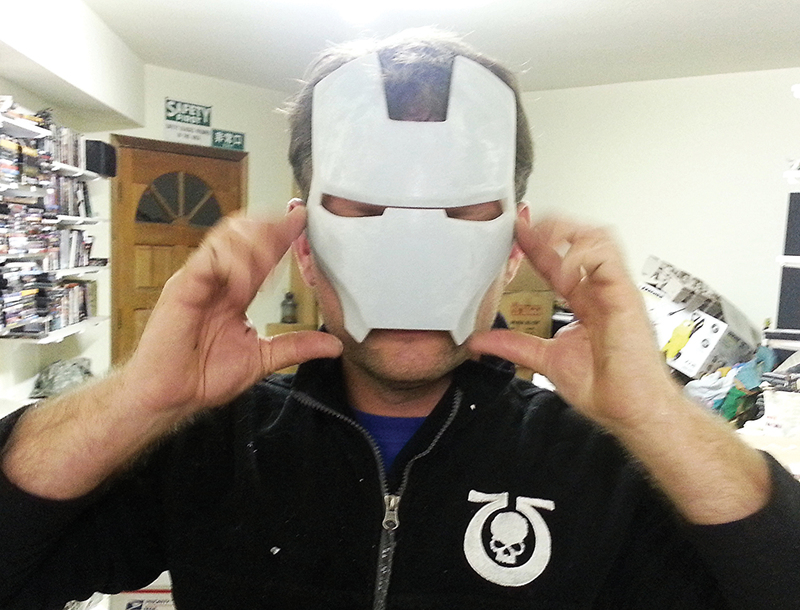 The first thing I had him working on was smaller detail parts for my own personal Ironman costume replica. I also had him make new weapon prototypes for my line of Combat Garden Gnomes. More recently, he’s been vital for building essential parts for a hero costume I’m making for a short film that will be used to pitch a concept for a feature-length movie. The character will end up being in a practical suit half the time and completely CGI the rest of the time. Building the parts digitally with the 3D printer and CNC machine will make it almost impossible for the audience to tell the difference. I’ve also got a few frivolous projects lined up. I had a friend of mine capture a 3D scan of my head. One of these days I’m going to make copies in various scales so I can make myself a Shawn Thorsson action figure. I’d also like to get a 3D scan of my skull so I can print it out and see what it looks like. Possibly mold it and make a pair of bookends, or a candy dish, or a paperweight. 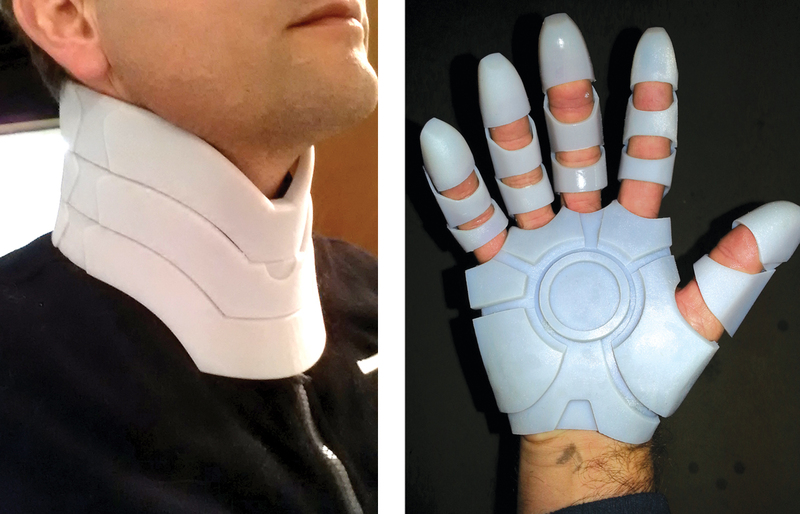 This article first appeared in the 2014 Make: Ultimate Guide to 3D Printing, page 38.